Sinigang na Sugpo sa Buko. A couple of weeks ago there were several articles that come out about sinigang sa buko, its origins or as the article claims created by someone else. This was of course rebuffed by most of the readers especially the Bikolanos and some from the Visayas. I totally agree with the readers any dish like the sinigang sa buko that is unique to its place of origin should not be attributed to individuals but to the locals of the regions where the dish is known for. I myself have had sinigang sa buko in the early 80’s on my Provincial work assignments at Legaspi. I also have read sinigang sa buko being served by restaurant in some part of Visayas, even in Mindanao and Palawan I did a Google search for the recipe but there are none. Except for one but I doubt it if the author really have cooked the dish imagine using 1/2 cup of sinigang mix powder. Ok I’ll guess I will just start from scratch to recreate the dish, anyone who have been regularly cooking sinigang sa buko please feel free to comment. 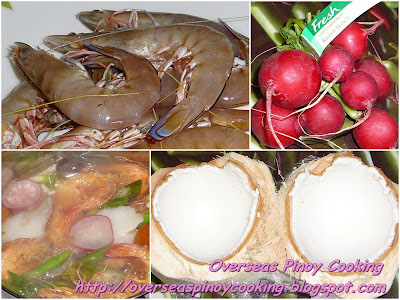 Sinigang sa buko is obviously sweet because of the coconut water, now the secret here is add the sinigang mix powder or any souring ingredient in small amounts until the desired sweet and sour taste of the soup is achieved. We do not want an overly sour taste on the already sweet broth of our siningang. Here is the recipe of my Sinigang na Sugpo Sa buko. In a pot boil 2 liters of water, add in the ginger, lemongrass, onion and tomato, simmer for 3 to 5 minutes. Add in the fish sauce, prawns and vegetables except the spring onion and green chili, simmer for 1 to 2 minutes. Add in the green chili, coconut water then the sinigang mix, 1 tbsp. at a time until the desired sourness is achieved, correct saltiness if required, continue to simmer for 3 to 5 minutes or until the vegetables are just cooked and the prawns has turned to bright orange red in color. Add in the coconut meat and spring onion, cook for another minute. Serve steaming hot. It is, If you won't mind your sinigang on the sweet side. Thanks for the visit. This is interesting. I love to cook and for sure I will try this recipe. Thanks for posting this recipe. Thanks for inspiring the readers of your delicious recipes.